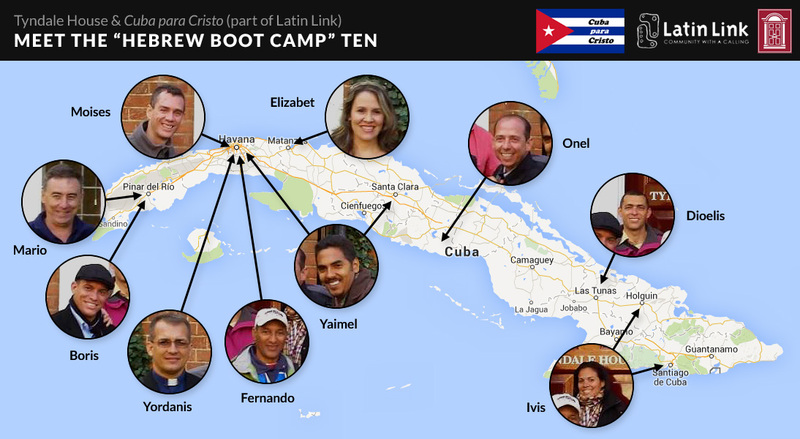 On January 9, 2015 10 Cubans arrived at Tyndale House for the first Hebrew Boot Camp. Here’s a brief bio of each one. Elizabet’s husband was sent to plant a house church with 12 members by the Pinos Nuevos denomination. From those 12, God has created a network of 36 established congregations and a branch of their seminary—in eight years! Elizabet will be the first Hebrew tutor in Pinos Nuevos, and will train their existing Old Testament lecturers in Hebrew too. Yordanis is a pastor in the Christian Reformed Church. In his words: I teach “Hebrew” in our seminary. I put that in quotation marks, because I have now realised that, far from teaching, I have been the blind leading the blind. He helped to found their new seminary, established when the liberalism of the only available alternative became intolerable. He will start a further course in his seminary to train up other Hebrew tutors, and to bring seminary graduates up to scratch in Hebrew. believe that it is possible to read the Bible in Hebrew!” He has been sent by the Western Baptist Convention to become their first ever full-time Hebrew lecturer, to improve the exegetical level of their MA course on which he teaches, and to offer remedial training in Hebrew to seminary graduates. Boris is a full-time lecturer in the Free Baptist Seminary, and co-ordinator of their network of seminary branches. He has been sent to provide Hebrew tuition in his own seminary and in those of other denominations in the same province. Dioelis: pastor in the Eastern Baptist Convention, graduate of their seminary, and has been praying to learn Hebrew for three years. Serves in an area far from any seminary, so has gathered leaders of local churches from various denominations to offer them better training. They are already signed up to learn Hebrew from him. Fernando is a pastor of a church in Havana, sent to us by the Baptist Seminary to teach Hebrew at several of its branches. Ivis: is a lay youth-worker and was about to start the second year in the Eastern Baptist seminary. She was chosen to set aside the year to learn Hebrew, which she had been trying to learn alone for several years. She will be their first ever tutor in Hebrew. Teenagers in her church have asked her to teach them Hebrew. Onel is a pastor of a church in central Cuba, where a small revival is taking place, resulting in many new church leaders with little access to training. Was sent by the Eastern Baptist Convention to plant a seminary four years ago, which he runs in his church. Onel was with us in the summer learning a little Hebrew, which he has been teaching since. He also has 20 students who are already pastors, to whom he teaches an Old Testament introduction, especially Pentateuch. His Convention has sent him to train with us for the sake of seminarians and local pastors. Yaimel is a pastor and comes to us from the Havana Baptist seminary, where he is Moises’ assistant in lecturing Hebrew. He spent a few weeks in Tyndale House in the summer learning Hebrew, and has prepared others in Havana to sit the entrance exam for this intensive course. His new-found introductory knowledge of Hebrew brought him a large number of eager students from various denominations and from the youth group of his own church. He will return to teach in two seminaries as well as in various other settings, where students are waiting for him. Dioelis is a pastor in the Eastern Baptist Convention, graduate of their seminary, and has been praying to learn Hebrew for three years. Serves in an area far from any seminary, so has gathered leaders of local churches from various denominations to offer them better training. They are already signed up to learn Hebrew from him. Ivis is a lay youth-worker and was about to start the second year in the Eastern Baptist seminary. She was chosen to set aside the year to learn Hebrew, which she had been trying to learn alone for several years. She will be their first ever tutor in Hebrew. Teenagers in her church have asked her to teach them Hebrew.